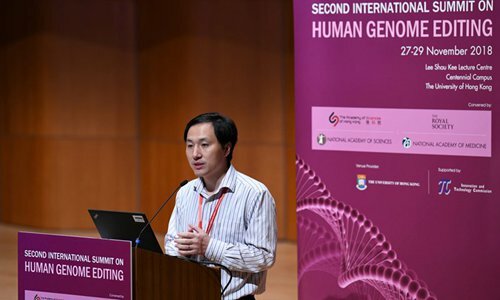 It is out of personal fame and wealth that Chinese scientist He Jiankui conducted the notorious experiment to create the world's first gene-edited babies, the Xinhua News Agency reported Monday. Since June 2016, He has gathered funding privately, evaded supervision and privately organized personnel, including those from abroad. He undertook human embryo gene-editing for reproduction, which is clearly prohibited in China, Xinhua said, citing an investigation team under Guangdong provincial government. From March 2017 to November 2018, He utilized a fake ethics examination paper and gathered eight pairs of volunteers, consisting of HIV-positive males and HIV-negative females for experiment, the Xinhua report said. In order to avoid regulations which prohibit HIV carriers from undertaking aided reproduction, He arranged for unrelated individuals to replace the volunteers for blood examinations. He also directed other unrelated people to conduct gene-editing on human embryos illegally and then had them transferred into the mothers' wombs, according to the report. Two volunteers who participated in He's experiment became pregnant. One of these individuals already gave birth to the twin girls, known as Lulu and Nana; the other is still pregnant. There were also one pair quitting the experiment and five others failing in getting pregnant, Xinhua reported. Guangdong provincial authority started their investigation into the incident shortly after He's team announced the birth of gene-edited twins on November 26th 2018, the report said. He and personnels involved will be handed over to the police and will be dealt with seriously in accordance with relevant laws and regulations. Guangdong provincial authority will also carry out medical observation and pay follow-up visit to babies and pregnant volunteers, Xinhua reported citing the head of the investigation team without giving a name. Such activities have seriously violated ethics and morality as well as credibility and integrity in the field of scientific research, said the Xinhua report.